This is an interactive view of an incidentally captured data set acquired in the project. We set out to capture the “Arene de Lutece” in Paris, using mostly mobile phones, and it was registered and reconstructed using the “MVE environment” developed in the project. The potree viewer uses a hierarchical out-of-core data structure also developed in the project in WP8. Note: please use Google Chrome Browser for best 3D performance. The default setting uses an adaptive point size for best quality. For faster rendering, switch to “Fixed” rendering mode (SizeType) . Point rendering also uses a high-quality splatting scheme by default, faster results can be achieved by switching to “Squares” quality. Rocca San Silvestro is an ancient village built around the tenth century. The complex is located within the Archaeological Park of San Silvestro, in the municipality of Campiglia Marittima. This dataset is composed by 308 images extracted from a full-HD video acquired with a drone. The images shows a Medieval village of miners and foundrymen founded around one thousand years ago. 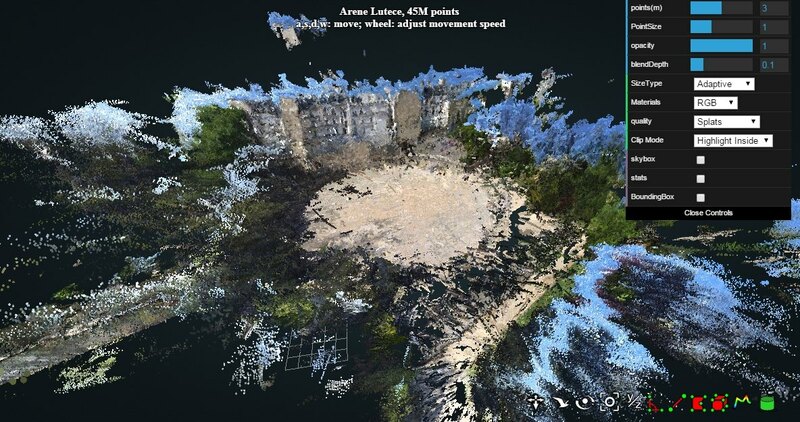 A point cloud has been generated with MVE and saved as PLY file.